World demand for oilfield chemicals is forecast to increase 6.0 percent annually to $33 billion in 2019. North America will remain by far the dominant market, while Asia/Pacific and Africa/Mideast markets grow the fastest from small bases. Drilling fluids will continue to account for the largest share of demand and will grow at a healthy pace. 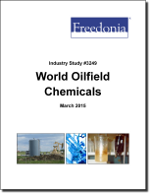 This study analyzes the $25 billion world oilfield chemical industry. It presents historical demand data (2004, 2009 and 2014) and forecasts (2019 and 2024) by product (drilling fluids, stimulation and enhanced oil recovery chemicals, production chemicals, completion and workover fluids, oilfield cement and cement additives), world region, and for 25 countries. The study also considers market environment factors, details industry structure, evaluates company market share, and profiles 43 industry players, including Baker Hughes, Ecolab, and Halliburton.